I am a Montessorian. I love teaching children using the Montessori Method. I have spent countless hours developing my own garden of printable materials, and have made enough mistakes to learn a lot. I truly believe in this work, and want to see as many people have free access to great quality for teaching. Thanks to anyone who gets my blog site out there by linking or sharing. 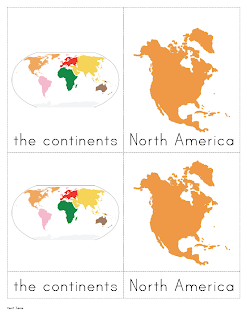 I have noticed that it is really difficult to find a good set of continent nomenclature cards for a free download. Here ya' go! Thank you for sharing my blog. My only intent is to help as many children as I can through the people who love and direct them. THANK YOU for helping me with that. wow these are great! thank you so much for sharing them for free. am using these right away for homeschooling! This is just the reason that I started my blog. To help out the homeschooling family and the school. You are welcome and good luck. Hi, being a homeschool mom of two girls (10 and 14) and having 14 little Montessorians upstairs....time is precious. So, thank you for sharing so generously!! I hear you! I am so glad to help. I hope that you keep coming back in the future to get more help. THANK YOU SOOOO MUCH...I have been thinking of making them the past few days. You just solved my problem. I will link back to you as soon as I post about our continent activities. Thanks again. You are so welcome. Have a great time with them! Thank you for your generosity - I am in the process of making materials to donate to some underprivileged schools and this makes it just that little bit easier to do that. Merci !. Je vais les utiliser dans ma classe en France. Montessori Pink Reading Series - IN PROCESS OF BEING UPDATED! I feel that directing children in learning is a life calling. I have spent many, many years learning what it means to be a child. You would think that having been one I would get it easily. I speak 3 year old better than most parents these days. I am so grateful for my gifts and talents. I want to share what I have with the children of the world. I feel so disappointed when I spend money on a download, and it does not live up to the expectation that comes with a cost. Montessori is an expensive endeavor, no matter how you look at it. This is my gift to all educators, be it a home or school. I make really great materials, and I want to share them with you.